Born and raised in Danbury, Connecticut, Sharon Siegel has committed her life to helping others. 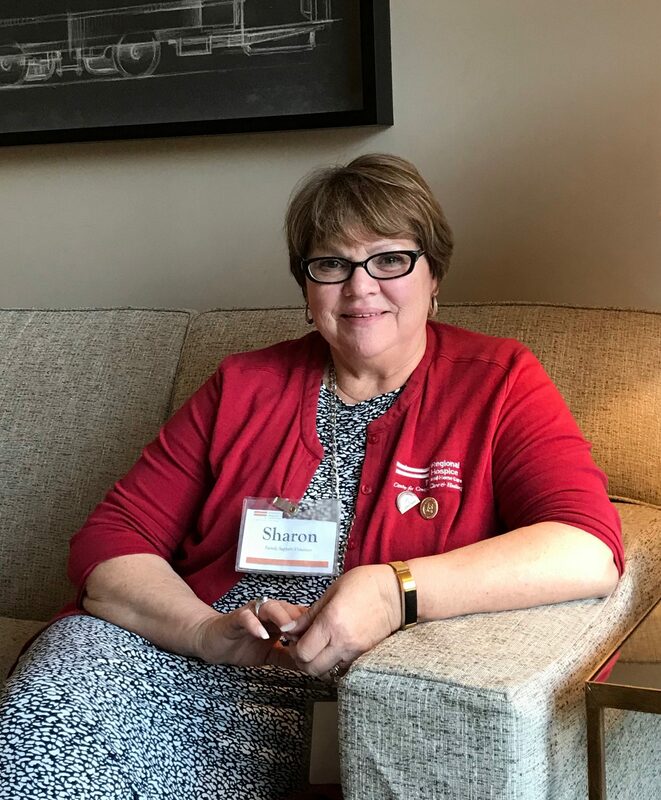 After losing her dad at the age of three in the Korean War, Sharon grew up wanting to become a nurse, but never had the confidence to truly pursue it. She married her high school sweetheart, Paul, and settled into the Danbury area, where Paul joined the family business – the Siegel Agency – and raised their two children in Bethel. A natural caregiver, her family would always call upon her when someone needed help. Her grandmother was in a nursing home for many years and Sharon would go there daily – morning and night – to visit with her and feed her. After being invited into the fold of a dear friend’s final months of life, Sharon promised her friend that she would continue to provide comfort to people at the end of life, something her friend identified as one of Sharon’s treasured gifts. Shortly after her grandmother’s death, Sharon approached Regional Hospice and Palliative Care (RHPC) to volunteer. She intended to uphold the promise she made to her friend. The Volunteer Coordinator felt it was too soon in Sharon’s own grief process, and suggested that Sharon work with children in the Healing Hearts Center for Grief and Loss. There, she could draw on the experience of her father’s death as a young child to help children with their own grief process. Sharon has faithfully volunteered her time and heart to the families at Healing Hearts and the patients of RHPC. Starting off as a substitute facilitator, she eventually transitioned to co-facilitate a support group of her own in 2001. When the September 11th tragedy at the World Trade Center affected many local families, the Healing Hearts Center offered support groups to help children and spouses who lost someone in the attack. Sharon co-facilitated one of these groups and says that these children will always stand out and hold a special place in her heart. For Sharon, the mixed emotions and notoriety around these deaths also resonated with her. As a child, she remembers feeling so embarrassed that everyone in Danbury knew that her dad was a Congressional Medal of Honor winner – and she never really knew him, having been only three when he died. While facilitating the children’s groups, she found it easy to relate to their feelings of grief – and for the children to relate to her. Sharon remembers feeling angry for a very long time after her own dad died, and so could help these children process their feelings and validate their emotions. Upon reflecting on the experience, she thinks that she learned as much from them as they did from her. In time, Sharon took the family support volunteer training and began to provide compassionate end-of-life support to hospice patients and families. First, she visited patients in the community, and later she joined the team at the Center for Comfort Care & Healing. At the Center, she provides patients and families support at their end-of-life in an in-patient setting, often “just” through her presence. For Sharon, being a Family Support Volunteer “is an amazing thing.” She walks through the door, and no matter what is going on in her life, she can put it aside and focus on the patients and family’s needs. She admits it may be hard for others to grasp that connecting with patients, families, staff, other volunteers is very comforting to her. When asked to reflect on why she continues to volunteer for so long, she says, “If I can give somebody five minutes of comfort – a family member, a patient, whoever it is – holding their hand, stroking their head, or doing whatever will give them comfort – that’s so rewarding to me.” It continually amazes her that total strangers allow her to go in and talk with them and sit with their loved ones at such a difficult time. Sharon considers her volunteer role an honor – and often emphasizes that she’s a part of a team – a family – and she’s grateful to do her share. She describes the other volunteers she has met at Regional Hospice as amazing – and values the special connection and bond that they form together. The RHPC staff have grown to love and count on Sharon, as well, knowing that she is just as willing to make a cup of tea as she is to stay late and sit with a patient who is dying alone. Sharon will be honored at the Danbury Giving Circle Leadership Breakfast this May. Find out more info here!